A simple and delicious jam that can be made at home with minimal ingredients. 1. Clean and wash the mangoes. 2. Squeeze the pulp into a bowl and keep aside. 3. Heat a heavy bottomed pan over medium flame. 4. Add the mango pulp, sugar, citric acid and food colour. 5. Simmer over low flame for a few minutes. 6. Mix the corn flour in a little water and add to the pan. 7. When the mixture starts to thicken, add the mango essence. 8. When a jam like consistency has been achived, switch off the flame and remove. 9. Cool and store in an air-tight container. 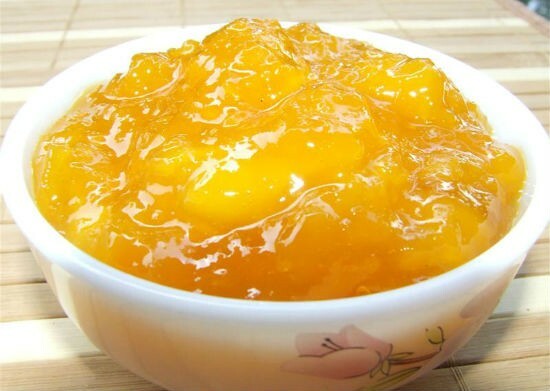 Feel free to comment or share your thoughts on this Mango Jam Recipe from Awesome Cuisine.